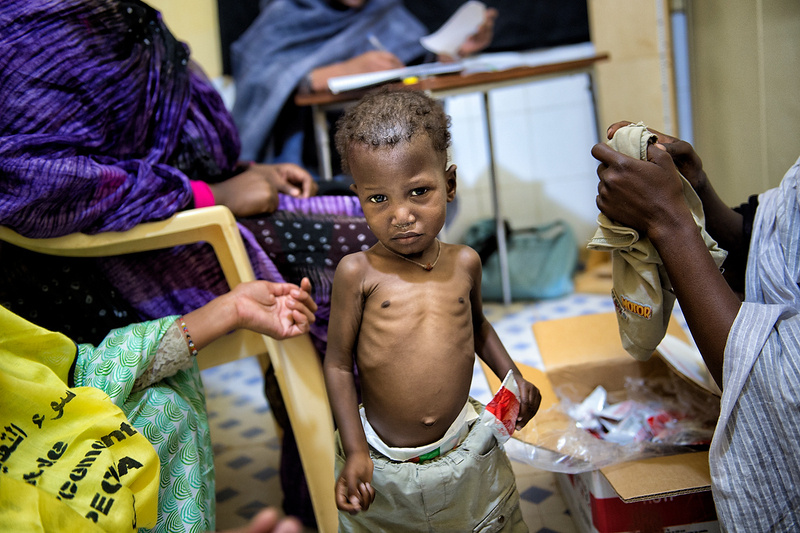 Muhamed, 18 month old, anthropometric measurements showed that he is malnourished and will be issued with Ready to Eat Therapeutic Food (RUTF) during the screening campaign on malnutrition in CRENAS centre, Tidjikja, Mauritania. Plumpy\'nut is a peanut-based paste for treatment of severe acute malnutrition and it removes the need for hospitalization, the 92 gram packets of this paste can be administered at home and allow larger numbers to be treated. During the malnutrition screening children and their mothers undergo anthropometric measurements containing weight for height, upper arm circumference and general check up. Children who\'s anthropometric measurements fall under general recommendation are referred further for treatment as required. In the centre appetite test is performed for children who are screened as malnourished. UNICEF CRENAS centre is suited within maternity ward building in Tidjikja and it is managed by NGO AMAMI.